If you are looking for dividend income, then REITs like these belong on your radar. As 2019 gets underway, investors need to put a tough 2018 behind them and take a fresh look at the investment landscape. Unfortunately, even after a down year, the markets remain at historically high valuation levels, and there's still a huge amount of political uncertainty. Under these conditions, adding a few reliable dividend payers to your portfolio continues to be a good idea, and real estate investment trusts can fit the bill. W.P. Carey (NYSE:WPC), Welltower (NYSE:WELL), and Tanger Factory Outlet Centers (NYSE:SKT) are all strong, high-yield options, and they are my three top REITs to buy in 2019. Check out the latest W.P. Carey, Welltower, and Tanger Factory Outlet Centers earnings call transcripts. W.P. Carey is a triple net lease REIT. This means that it owns a portfolio of buildings, but that its tenants generally pay all of the operating expenses of the properties, including taxes and maintenance. Essentially, Carey buys assets from companies, then immediately rents them back to the previous owners under long-term leases (often with built-in rent escalators). Usually, these transactions provide the tenants with the cash they need to pay for expansion efforts or mergers. Carey profits from the spread between its rental rates and its financing costs. There are a lot of triple net lease REITs, but Carey stands out from the crowd because of its size, diversification, and long history. At this point, it has a portfolio of roughly 1,180 properties leased to more than 300 tenants. Around 63% of the rent roll is generated from the United States, with the rest largely coming from Europe. And its portfolio is broken down by industrial (42% of rents), warehouse (24%), retail (13%) office (12%), education (2%), and other (7%). Without a doubt, Carey is the most diversified triple net lease REIT investors can buy. This is important because Carey is an active portfolio manager, buying and selling assets on a regular basis. Its broad sector and geographic diversification gives it more levers to pull as it looks to keep rewarding investors with regular dividend increases -- it has boosted its dividend for 21 consecutive years. And its yield of 6.2% is well above industry bellwether Realty Income's roughly 4.2%. If you are looking for a proven REIT, Carey should be on your buy list in 2019. Another company that you should take a serious look at now is Welltower, one of the largest healthcare-focused REITs. Its portfolio of roughly 1,500 properties is a mix of senior housing (66% of net operating income), outpatient medical facilities (16%), long-term care/post acute (11%), and health systems (7%). Over the last couple of years, it has transitioned toward private pay, with around 90% of its rents coming from this customer group. This means that changes in government payments systems (Medicaid and Medicare) don't have a big impact on Welltower. 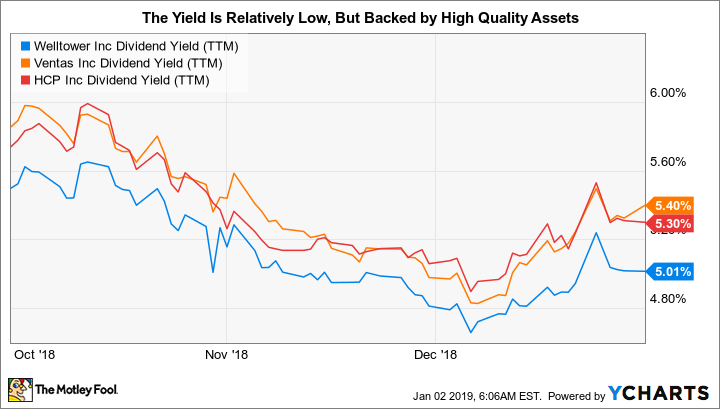 Its dividend yield is currently around 5%, just a little lower than its peers. That, however, is partly a function of Welltower's focus on high-quality properties in desirable locations. Management has a preference for sites in wealthy areas with high barriers to entry and minimal local competition. The shift toward private pay, meanwhile, depressed its financial results, lifting the company's price-to-trailing-FFO ratio to a fairly high level, historically speaking. So Welltower stock isn't exactly cheap, but it's still a quality company. WELL Dividend Yield (TTM) data by YCharts. The bigger story here, however, is that Welltower is one of the largest and strongest healthcare REITs in an industry niche that's in the midst of a huge demographic tailwind. Its customer base consists primarily of baby boomers and their parents, two groups that will push the ranks of the 85 and older age group (the demographic that needs the most medical care) up materially faster than any other group over the next 20 years. And the REIT just announced an acquisition in the medical office space, suggesting that the transition that has depressed results over the last couple of years is over -- and that top- and bottom-line growth could start to pick up again in 2019. Welltower is in a great position to benefit from the demographic changes taking shape. Investors with a long-term focus can ride upward with it, collecting a 5% yield along the way. The last company on this list is only appropriate for investors with a notable risk tolerance. Tanger owns 44 outlet centers, and it has felt the pinch of the so-called retail apocalypse that's pushed many chains into bankruptcy court. The REIT's net operating income growth basically stalled in 2018. However, Wall Street's fears here appear to be overblown -- the stock is down roughly 50% from its mid-2016 highs. The word apocalypse is hyperbole in this instance -- people still do most of their shopping in person, and high-quality malls remain desirable places for consumers to visit. As for Tanger, it owns assets that have low operating costs and, thus, relatively low rents for its lessees, which in turn makes it easier for retailers to turn a profit. In fact, even during economic downturns Tanger's occupancy levels tends to remain high -- they've never fallen below 95%. To be fair, it is aggressively working with customers right now, via temporary rent concessions, to make sure occupancy remains robust. But that's well worth any short-term hit to the top and bottom lines, since fully occupied malls make for a better shopping experience. 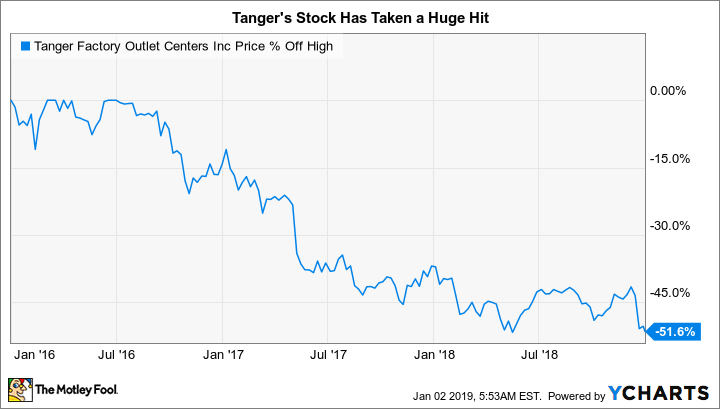 Basically, Tanger is doing what it needs to do in order to ensure its properties will succeed over the long term -- the same game plan it used during previous periods of retail weakness. The real reason to like Tanger, however, is its rock-solid financial status. Total debt as a proportion of total adjusted assets is just 51%, well below key debt covenant levels of 60%. And it covered interest expense by 5.3 times in the third quarter. Leverage is not a big problem. The dividend, meanwhile, only eats up 45% of funds from operations (FFO), which is a low payout ratio that leaves it plenty of cash for debt repayment, stock buybacks, and investment in its portfolio. Yes, the changes taking shape in the retail sector are impacting Tanger. But the company is taking steps to work through the upheaval and, equally important, has the financial wherewithal to do so. And with the stock price down so much, its yield is a very attractive 6.6%. The dividend, by the way, has been increased every year for 25 years. For long-term investors who can stomach a little near-term uncertainty, Tanger looks like an opportunistic buy now. Investors looking for income investments in 2019 should clearly take a close look at the REIT sector, an area of the market that is known for high yields. But you'll want to focus on the names that offer the best combinations of yield, portfolio strength, financial fortitude, and opportunity. Carey, Welltower, and Tanger score well on each of these fronts, and each deserves a deep dive today.